Our 78 rpm/ 10" Record Storage Boxes are designed to properly hold 78 rpm and 10" records. Records should always be stored vertically with like sizes (i.e. don't stack records one on top of another, or with other sized records interwoven between them). Our boxes are super strong, properly sized and stackable. 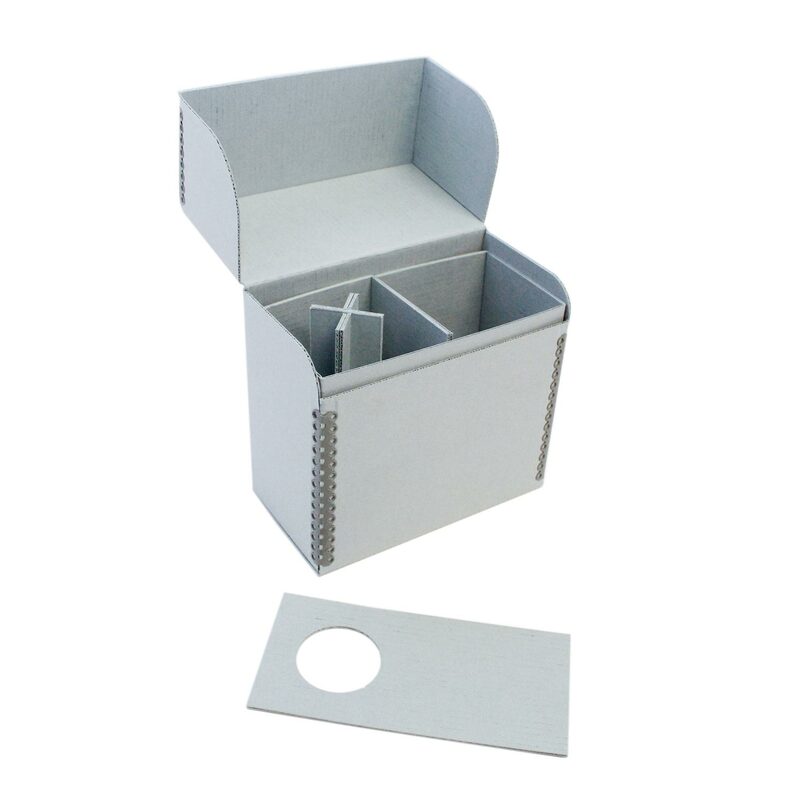 They come with 3" deep sturdy covers and die-cut handles that can be in the open position for carrying or closed position for storing. Boxes ship flat and fold together. Our divider cards fit in the boxes with the lids on. Plastic Corrugated 78 rpm/10" Record Storage Boxes. They are made with acid-free, water-resistant, antistatic and vermin-resistant material. We have added Wax Cylinder Storage Boxes for 4" and 6" cylinders. 78 rpm Record Storage Box. Holds 50-65 78 rpm records. 10-3/4 x 10-3/4 x 13". 10-3/4 x 10-3/4 x 13"
White 275-lb-test white (outside) corrugated cardboard. 78 rpm Record Storage Box. PLASTIC Corrugated. Holds 25-30 78 rpm records. 11 x 11-3/8 x 8". 11 x 11-3/8 x 8"
Made from acid-free polypropylene. This material is also water-resistant and antistatic. 78 rpm Record Storage Box. Archival. Holds thirty 78 rpm records or up to 17 Edison discs. 10-7/8 x 10-1/2 x 7". 10-7/8 x 10-1/2 x 7"
The material is acid-free, lignin-free, 60 pt. blue-gray barrier board with white liner. pH 8.0-9.0. 3% calcium carbonate buffer. Reinforced metal edges for extra strength.